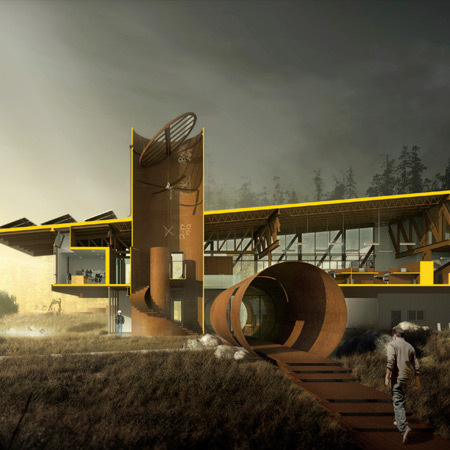 Tom Kundig of Seattle studio Olson Sundberg Kundig Allen Architects has designed an extension to a steel pipe factory that uses giant pipes as architectural elements. The building, for T Bailey Inc, will use sections of the giant pipes made at the facility that are usually used to make wind turbine towers. Tom Kundig of Olson Sundberg Kundig Allen Architects has designed an 11,700 square foot office addition to the existing heavy industrial manufacturing plant of T. Bailey Inc. in Washington State. The building explores the idea of using the client’s product— pipes used in wind turbine towers — in the construction of its headquarters. Visitors enter the building and climb to the main office space via a horizontal 14’ and vertical 22’ diameter pipes. Located within the vertical pipe, a skylight and large fan ventilate the main office floor. The skylight and fan are powered by solar energy. Warm air is sucked from the office space through the stairway pipe and evacuated out of the building, significantly reducing the cooling load. Materials are unfinished – concrete floors, unfinished steel, and an exposed structure – giving the space a raw aesthetic while reducing the coatings and toxic materials added to the building. The roof’s slope directs runoff into a rain garden and adjoining landscape.